Smartwatches that mirror the look of the Apple Watch's hardware and software are being advertised on China's most popular online shopping service. 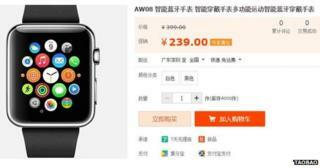 Alibaba's Taobao site lists devices branded the AW08 and the iWatch. They both feature "digital crown" dials on their sides, similar-styled straps and identical user interface graphics to Apple's forthcoming wearable. However, their listings reveal they run on Google's Android platform rather than Apple's Watch OS. Taboao acts as a showcase for third-party sellers - much like eBay and Amazon's Marketplace service - and some vendors have taken pains to make clear that the devices they are selling are not Apple's own technology. One listing, which was highlighted by the Financial Times, even used the slogan: "Knockoff Apple watches have hit the market!" Taobao's owner said it did, however, remove deceptive ads. "Alibaba Group is dedicated to the fight against counterfeits," a spokeswoman for the company told the BBC. "We work closely with our government partners, brands and industry associations to tackle this issue at its source. "We also utilise technology like data mining and big data to scrub our platforms of counterfeits." One Beijing-based expert - who has not seen any of the copycat watches in person - said there could be considerable demand for the gadgets now that they were being advertised online. "Apple products are very popular in China, and it's possible that Chinese consumers will want to be seen to be the first person on their block to wear its Watch," said Matthew Forney, president of the business consultancy Fathom China. "However, I think most of those consumers are aware that there has been an issue with fakes and copycats on Taobao and would be highly suspicious of the devices. "And most people who buy them will do so knowing they are not Apple's real Watch." One Hong Kong-based intellectual property lawyer, who has worked for Apple in the past, said the US company had ways to block the sale of smartwatches that had copied its designs, but added that doing so could be expensive and time consuming. "There's a legal concept called unfair competition that is recognised around the globe, but in China you can't get a preliminary temporary restraining order for it - you have to go through the law as a slog, and that takes time," said Joe Simone, director of Simone IP Services. "There are other possibilities - such as making copyright or design-patent infringement claims - but the real problem is the amount of infringing activity that's taking place in China, there's just too much of it. "The other option for Apple would be to ask Alibaba itself to take down these ads, but that involves filling out forms for each of them. "For Apple it's like going after a room full of mice - there's just too many of them and even if you clear the room today they'll be back tomorrow." Confusingly, some listings on Taobao that appear to advertise copycats may in fact represent the genuine article. One ad for an "Apple iWatch" initially suggests the product will be available for shipping within 15 days - ahead of the Apple Watch's release. But the listing's fuller description reveals it only represents a "booking link", meaning the shopper is only putting down a deposit that must be added to later once the vendor has obtained stock from Apple. Alibaba was criticised by a regulator at the China's State Administration for Industry and Commerce (SAIC) in January for failing to do enough to tackle the sale of counterfeit goods on Taobao. The company's founder, Jack Ma, later insisted that his company took the problem seriously. "We don't want to be misunderstood by the world that Taobao is a platform for selling fake products," he said. In light of this, Mr Forney said that the e-commerce giant was expected to crack down on listings that might give consumers genuine cause to feel they had been deceived. "Alibaba faces heightened scrutiny by its regulator for fakes sold within China," he said. "So, I would imagine that Alibaba would want to remain above suspicion regarding sensitive new product releases such as Apple devices."